CHETESHWAR Pujara's third century of the series has lifted India to 4-303 at stumps on day one of the fourth Test in Sydney, where Australia failed to strike with the second new ball. Pujara finished 130 not out at stumps on Thursday, when his highest score of a career-best series significantly boosted India's bid for a maiden Test series win in Australia. India's most productive day with the bat this summer started when Virat Kohli called correctly at the toss. Josh Hazlewood struck with his third delivery of the innings when recalled opener KL Rahul was out edging, but from that point on it was a day of toil for Australia's star-studded attack. "He (Pujara) is a class payer. We just have to hold our patience longer than him and we haven't done that so far," Hazlewood said on Fox. "We had some good spells and some poor ones." Pujara, as he has been throughout the series, was an immovable object occupying the crease with minimal fuss and maximum effect. Hazlewood temporarily unsettled Pujara late in the morning session with a bouncer that struck the back of the helmet, and Mitchell Starc left a bruise on the Indian's arm late in the final session. Having quickly regained composure after both blows, Pujara has spent almost 30 hours batting in this series, underlining how pivotal his patience has been in the tourists' retention of the Border-Gavaskar trophy. "Batting is like meditation," Pujara said in Melbourne when asked about the mindset that allowed him to put such a high price on his wicket. Mayank Agarwal's brisk 77 set the tone for India, and Hanuma Vihari also kept the scoreboard ticking over with an unbeaten 39. Pujara clattered three Marnus Labuschagne long hops to the rope in the penultimate over of the post-lunch session. Tim Paine has wasted one of his two reviews - the skipper referring a caught-behind shout off Pat Cummins' bowling when Pujara was on 12. Pujara's partnerships with Kohli have represented a stumbling block for Paine's team throughout the series, most recently when they combined to outscore Australia's entire first innings at the MCG. The gun batsmen's 54-run stand in Sydney was ended by Hazlewood, who had Kohli caught behind down the leg side in the first over after tea. 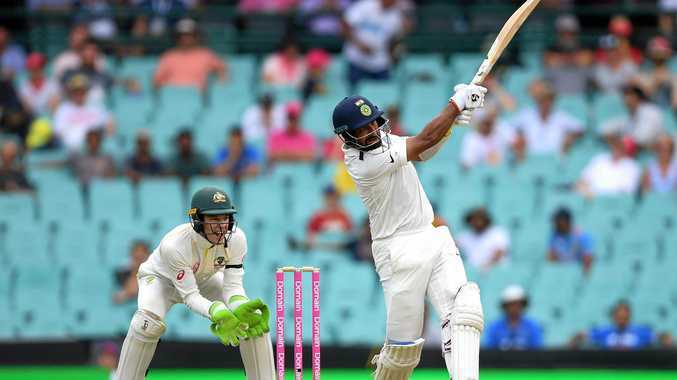 Ajinkya Rahane's dismissal on 18, to a rearing delivery from Starc, then gave the hosts hope of exposing India's tail on day one, but that optimism proved forlorn.